22 What Am I Gonna Do, Ma? 96 What Is There To Say? 101 Don't You Know, Yockomo? 311 How Important Can It Be? 335 What Is This Thing Called Love? The Happiest Christmas Album Ever! 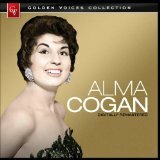 Ladies and Gentlemen, Miss Alma Cogan! Alma Sings with You in Mind / How About Love! Christmas With the Stars a Wonderful Christmas Time!